South African Hunting Safari in the Eastern Cape Sundays River Valley with one of the best PH’s in Africa! This package is available as 2 x 1 (two hunters, one guide) and is ideal for two friends or father and son hunting. This package includes an impala, a springbuck, a blesbuck, and a wildebeeste for each hunter. Hunters may choose a black or a blue wildebeeste. Additional species may be added as available. 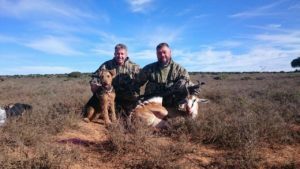 The hunt occurs in the scenic and varied terrain of the Sundays River valley near Port Elizabeth and neighboring farms and ranches. The accommodation is in a beautiful hunting lodge in the Valley near Addo Elephant park. Our PH will pick you up in Port Elizabeth and you will be in camp in less than 2 hours. If you have always wanted to hunt Africa with friends without breaking the bank this trip is for you !